June 20, 2017 | 12:15 p.m.
A female black-legged tick is engorged after a blood meal. 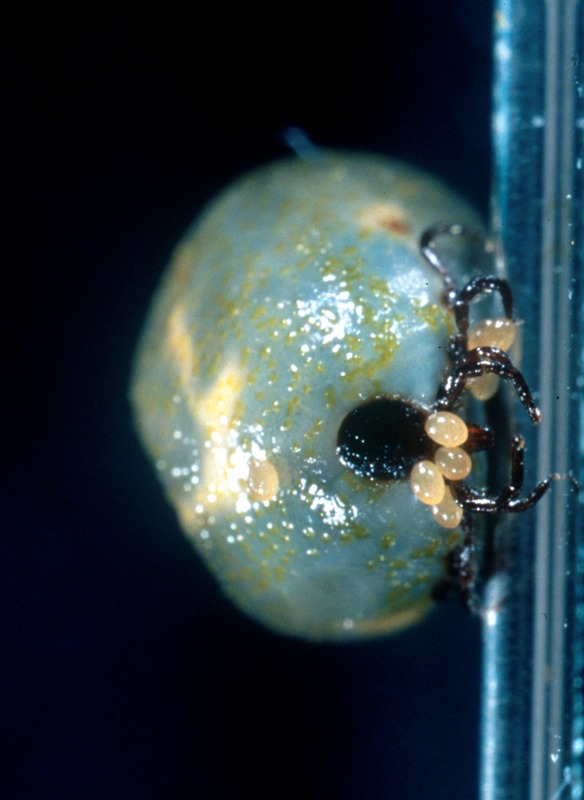 The tiny deer tick is an incredibly effective vector for disease. It's made Wisconsin one of North America's hotspots for Lyme disease, and is spreading several other pathogens dangerous to people. One that's had a sharp uptick since 2000 is anaplasmosis. Like Lyme disease, anaplasmosis is a bacterial infection. Deer ticks pick up and spread Anaplasma phagocytophilum as they feed on animals and humans throughout their life cycle. Until the early 1990s, scientists actually considered Anaplasma phagocytophilum a member of the genus Ehrlichia, some species of which cause another tick-borne illness duly named ehrlichiosis. Anaplasmosis generally follows Lyme disease's geographic distribution, concentrated most heavily in the Upper Midwest and northeastern U.S., reports the Centers for Disease Control and Prevention. People in their late 50s and older are especially vulnerable to the disease. Anaplasmosis can be tricky to diagnose, sharing an array of symptoms in common with many other illnesses. Moreover, these symptoms can show up in varying combinations from patient to patient, and do not include the telltale rash that can often indicates Lyme disease (unless a tick has managed to infect the patient with both pathogens). Health care providers who detected anaplasmosis early can generally treat infection effectively with antibiotics. But it can cause serious kidney or neurological problems if left untreated or if the patient has a compromised immune system. The disease can be fatal, but the CDC reports that less than one percent of the people who've been infected have died. Entomologists and public health officials have observed that when deer ticks move into a new area, Lyme disease is the first tick-borne illness to start showing up in the local human population.Other tick-borne diseases tend to lag behind. That pattern has been the case with anaplasmosis in Wisconsin. State health records show just 38 cases of anaplasmosis in 2001, but since 2010, that number has consistently been between 500 and 700 per year. Caused by several Borrelia bacteria species, Lyme disease began its steep climb a bit ahead of anaplasmosis, in the early and mid-2000s, and is still far more widespread. In most recent years, Wisconsin has often documented more than a thousand Lyme cases per year, and the actual number of infections is almost certainly much higher. Anaplasmosis was likely circulating among the Upper Midwest's deer tick and host animal population population for a long time before humans started getting infected, said Susan Paskewitz, a professor of entomology at the University of Wisconsin-Madison who studies the disease. "It's gotten to a level where it's got to be more abundant," she said. In a sense, Wisconsin's period of aggressive logging in the late 1800s and early 1900s may have given people a bit of a reprieve from tick-borne diseases, Paskewitz noted. As the state's large swaths of clear-cut forests began to gradually recover, that created more habitat for deer ticks and the mammals they feed upon, like white-footed mice and of course deer. "I suspect that anaplasmosis is not quite as efficiently transmitted and it took longer for it to rebound," Paskewitz said. Despite the lag, evidence suggests Anaplasma phagocytophilum has rebounded. Paskewitz has found hotspots where 12 or 13 percent of nymph-stage deer ticks are carrying the bacteria. Along with other entomologists and microbiologists, she is working toward a better understanding of which mammals serve as the best reservoirs for pathogens, and how long certain types of pathogens linger in different reservoirs' systems. Some tick-borne bacteria, like Anaplasma and Ehrlichia, are generally considered to be short-lived in animal hosts like white-footed mice, whereas Borrelia is known to be more persistent. However, the Midwest's prevalence of tick-borne disease might really come down to regional variations in the deer ticks' life cycle. "You all have great ticks up there, infected with everything," said Ellen Stromdahl, an entomologist with the U.S. Army Public Health Center in Maryland. Stromdahl and her team analyze ticks sent from military installations across the U.S., and she said Wisconsin's Fort McCoy and Minnesota's Camp Ripley are among the biggest contributors. Like many other entomologists, Stromdahl believes Wisconsin's relatively short warm season intersects with deer ticks' feeding habits to intensify the spread of disease. 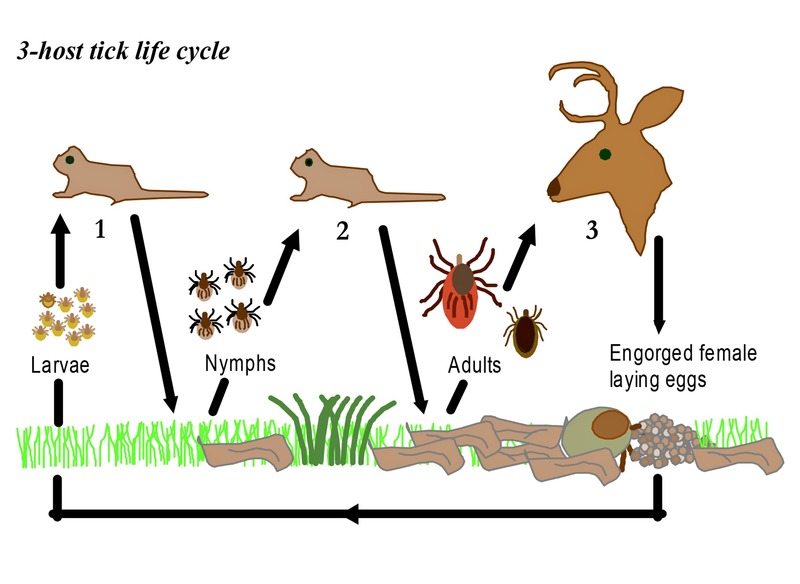 Ticks feed on multiple hosts through their life cycle. Also called black-legged ticks (Ixodes scapularis), deer tick larvae hatch from eggs. After feeding on blood from its first host, a larval tick molts and becomes a nymph. As a nymph, the tick overwinters, feeds again, molts and grows into an adult. It will then feed on a third host and mate. These ticks can transmit diseases to humans at either the nymph or adult stages, having picked up pathogens from the hosts they fed on as larvae and nymphs. Researchers believe nymphs do the most to spread diseases to human and animal hosts. Some tick species may be able to pass pathogens to their young, a process known as transovarial transmission. One adult female tick can lay thousands of eggs, but researchers haven't established whether that's a big contributor to tick-borne disease. In a 2011 study, Brazilian researchers infected another species of tick (Amblyomma aureolatum) with Rickettsia ricketsii, the bacterium that causes Rocky Mountain spotted fever. They found that the bacteria actually slowed down reproduction, so at least in the case of that particular pathogen, transovarial transmission likely wasn't a big factor. An adult female deer tick laying eggs. In the northeastern U.S. — the country's other big tick hotspot — milder weather lets ticks spread all their feeding over a longer period. In the Upper Midwest, though, this activity happens on a more condensed time scale. Newly hatched larvae are coming out to feed, but so too are nymphs and adults emerging from their winter dormancy. Say an infected nymph or adult picked up Anaplasma phagocytophilum in an earlier stage, and infects a mouse that it feeds on in spring. That mouse will likely have less time to clear the bacteria from its system if another deer tick comes along to feed on it. In turn, that second tick has a higher chance of picking up the pathogen and passing it on to another mammal, including a human. "If the generations of mice and ticks are spread out more, some of these pathogens don't live long in the mouse, so some of the animals might have the chance to clear the infection before the next generation of ticks," Stromdahl said. This dynamic is relevant to all tick-borne diseases, but there are a couple of interesting wrinkles with anaplasmosis. For one, scientists have found evidence that Anaplasma phagocytophilum actually makes infected deer ticks more resilient against the cold. In a 2010 study, researchers at Yale exposed a group of infected deer ticks and a control group of non-infected ones to varying levels of extreme cold. The infected ticks held up much better in these conditions, and were more likely to develop a special protein that helped stave off freezing. Many vertebrate, arthropod, and other species have antifreeze proteins. It appears that in deer ticks, the organism is pushing the insects to express a pre-existing genetic tendency. Climate change adds another layer of uncertainty to the future of anaplasmosis. On one hand, warmer winter temperatures enable ticks to spread farther north, meaning more areas could eventually see growing occurrences of anaplasmosis. But warmer conditions in the Upper Midwest also mean the region will gradually have fewer days per year when temperatures are below freezing. That lengthens the ticks' feeding season and might temper the intensive cycle of infection, bringing the region more in line with where the northeastern U.S. is now. One 2015 study suggested that climate change might reduce the risk of tick-borne illnesses like anaplasmosis that survive for relatively short periods inside a mammal host. However, it found that warming could actually fuel an increase in Lyme disease, whose pathogens live longer in a host and therefore might actually benefit from a longer season of tick activity. In the short term, health officials in Wisconsin want to do more to spread awareness about anaplasmosis. Wisconsinites have been hearing warnings about Lyme disease for years, but there's been far less emphasis other tick-borne illnesses. 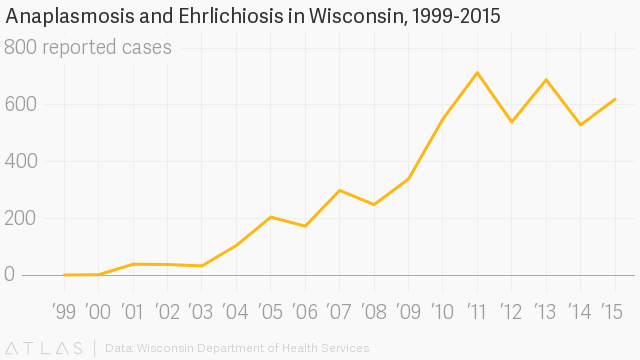 The Wisconsin Department of Health Services Division of Public Health is working on new fact sheets about anaplasmosis and ehrlichiosis that it will soon post online, said spokesperson Elizabeth Goodsitt. Each will include information about "the cause, common symptoms, treatment, and prevention," she noted in an email interview. "We are also working to create a flow-chart for providers with recommended lab testing, interpretations, diagnosis, and treatment of anaplasmosis." 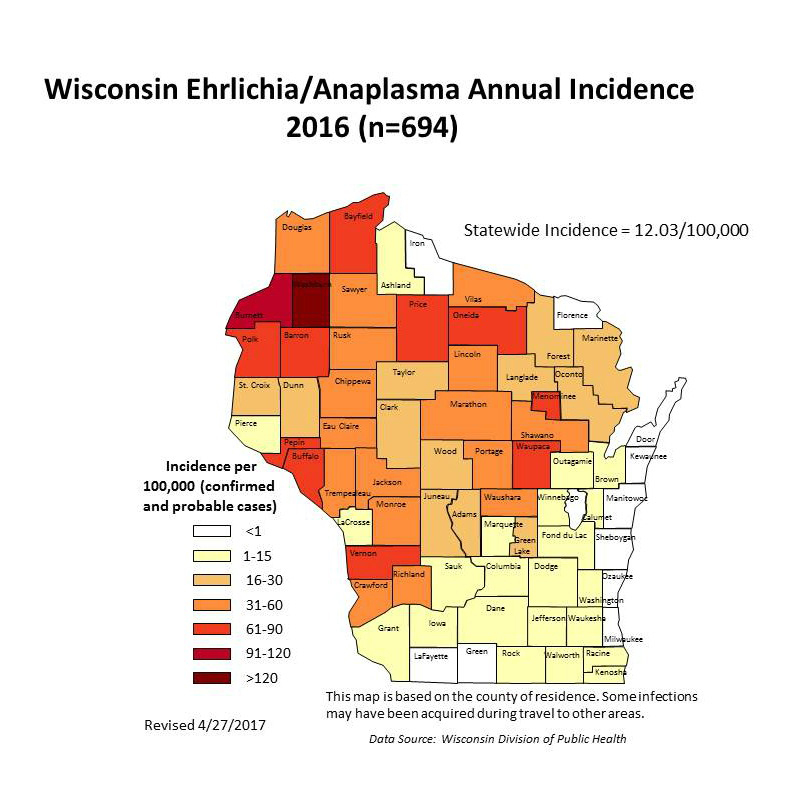 Anaplasma incidence in Wisconsin increases in more northern and western counties. One challenge is that anaplasmosis is very hard to diagnose by symptoms alone. But lab tests are expensive and imperfect, which means DHS recommends that healthcare providers start antibiotic treatment for the disease before getting lab confirmation. "The most common method of laboratory detection is serologic testing using an indirect immunofluorescence assay," Goodsitt explained. "However, there are limitations to this type of testing. Often only a single [test] is performed, which can produce a negative result if the specimen is collected in the first week of illness before the patient has developed a detectable immune response. This assay can also produce false positive results due to cross-reactivity with related bacteria." And as deer ticks spread, entomologists like the U.S. Army's Ellen Stromdahl will be working to get a better handle on how anaplasmosis spreads with them. "Over and over again we won't see the other pathogens [than Lyme disease] for a few more years," she said. "Is it just because we were only getting, say, 40 ticks a year to test from a given location and if we were getting 400 would we be seeing these less prevalent pathogens? I'm not sure."